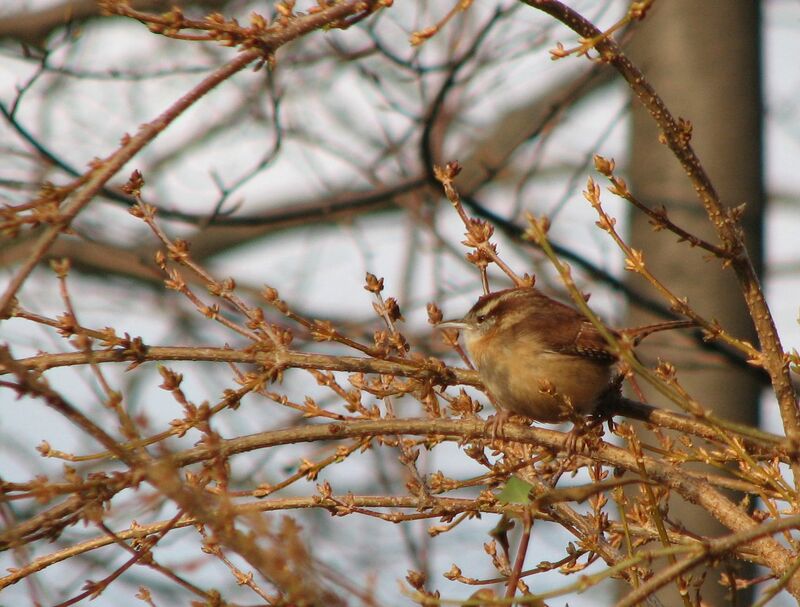 Tea-kettle, Tea-kettle, Tea-kettle…I hear the resident Carolina Wren throughout the Spring, Summer and Fall, however, until this year, I had never heard a peep in Winter. When I tidied the yard for the colder months, I neglected to bring in the unused wren house that Uncle Mellie made before he passed on. Now, I find I have a highly visible yard bird. Since pairs remain together on permanent territories, I wonder if he/she/they is/are snuggled into the house on the cold winter nights? I wish the bears were down for the winter, so I could put out suet to help fuel that tiny body. Heck, as long as I’m wishing, I wish that all my squirrels would go live deep in the woods far from my bird seed too. There is chasing, and then there is chasing, and then there is the possibly getting a lifebird a few blocks from my house. I got an email from the Director of Weis Ecology Center that she had a female RED Crossbill at her feeder. Red? Since she only lives around the lake from me, walking distance really, I threw on my coat, grabbed my camera and drove over. (I didn’t realize it was walking distance when I drove, OK?) When I approached the house, I could see activity on her back deck and after a few minutes of scanning the trees, her deck and her neighbor’s deck; I spotted a drab bird with a funky bill. I could only see the bird’s head popping above the deck railing. She flew, I smiled, Score! and settled in for a long wait at the end of her driveway. I wanted to see her again. But I never did. Karla came out and invited me onto her deck and then we all went next door to her neighbor’s house and watched and waited from the comfort of their kitchen. The Crossbill was consorting with a flock of House Finches and a lone Pine Siskin. We watched hoardes of Finches come and go, eagerly scanning any and all birds high in the trees. But, to no avail. I am hopeful she is still around. I ended up spending a lovely day with Karla and her husband, met her charming neighbors, and watched and chatted about birds. My kind of Saturday. Having things to do, a pie to bake and not wanting to wear out my welcome (as my mother would say), I left for home as the light lengthened and turned golden. When I got home, my own little flock of feathered neighbors were congregated in the forsythia next to the garage, (I swear they associate the sound of the garage door opening with food, like Pavlov’s dogs.) 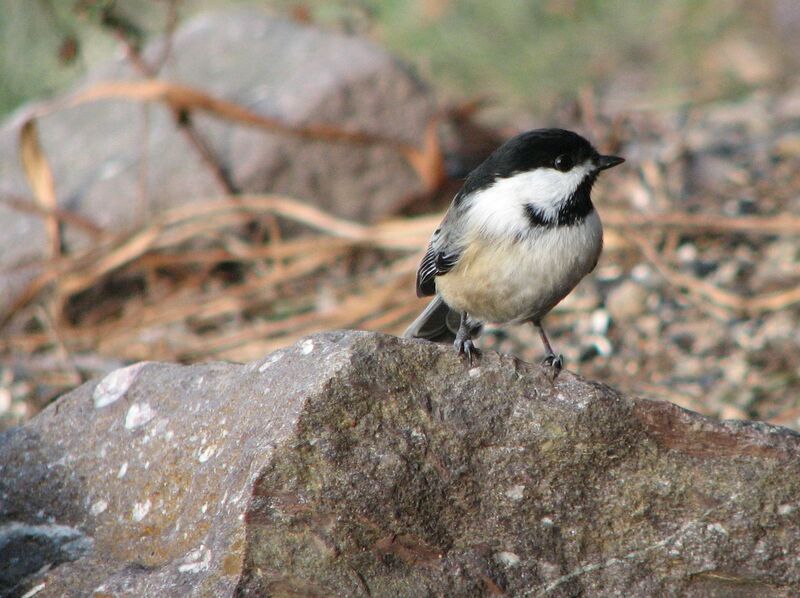 I filled my hand with black-oil sunflower seeds and stood stock-still as the bravest of the Chickadees landed on my outstretched fingers, selected a seed then flew to a sturdy branch to peck it open. I love that. All Turkeys are not the same. According to Clements Checklist of Birds of the World, there are 6 subspecies of Wild Turkey; 4 of them in the US, the other 2 in Mexico. I have only seen 3 of the US ones. Meleagris gallopavo merriami — the Western bird–in this case taken in SE Arizona. Notice the white tail stripe. Meleagris gallopavo silvestris is in the Central and Eastern US-my local bird. 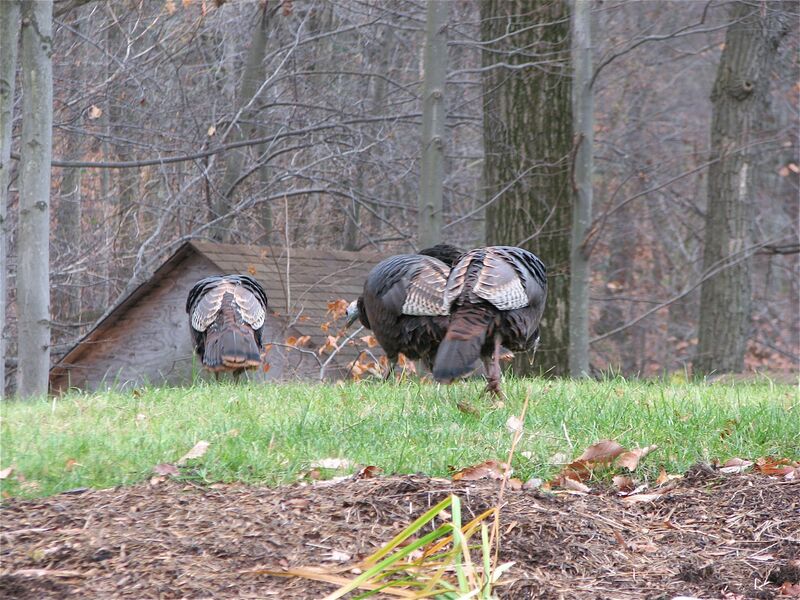 Interested in hearing them gobble? Check this out. The other one is Meleagris gallopavo osceola an extremely local Florida bird. Huh, I never even knew there were turkeys in Florida. Today, your turkey, like mine, will no doubt be the oven-roasted domestic variety. Happy Thanksgiving to you and yours. You have to go to Egret’s Nest. She has great photos and can really talk turkey. No, really. 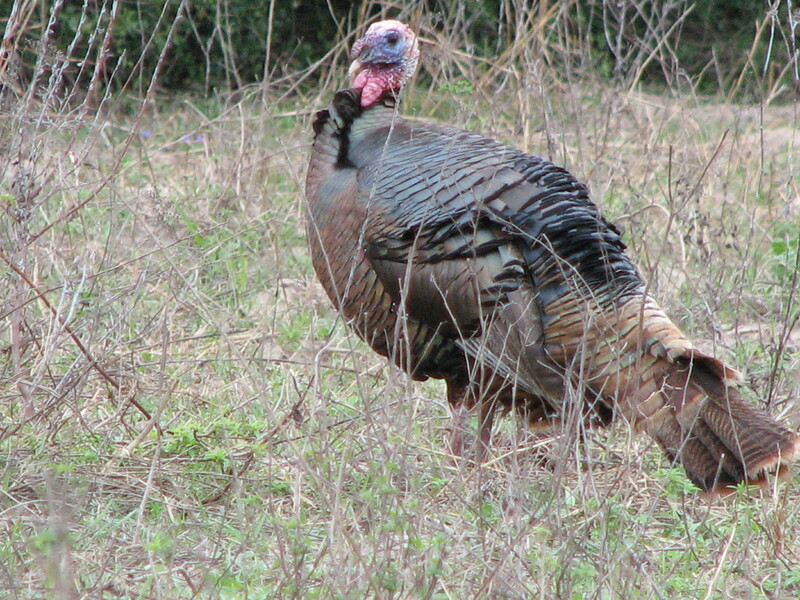 Picus Blog has a Turkey pic up today. BirdGuides Blog’s description of the local UK bird is spot-on and true in many parts of the US too. 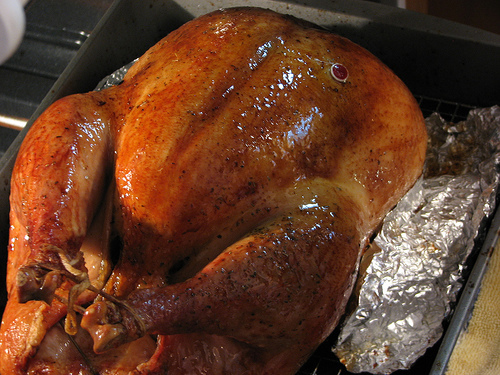 Great Turkey pictures and Naked Thanksgiving over at Birdchick. Musings on Nature did a Turkey program at the park and has pictures. BirdFreak offers us a turkey photo and a plea for any leftovers. 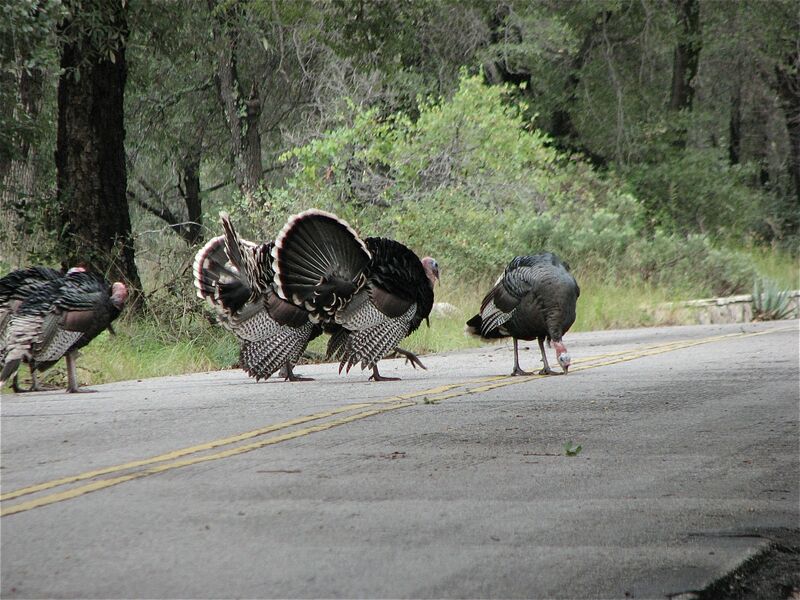 Thanksgiving wishes from the Birder’s Report along with a shot of a spectacular Tom. Bill of the Birds has great close-ups of face and feathers. All Hail the King! Well, I guess it’s more of a Prince at this point. Once in a while the birding gods smile on me. Late last night I saw that a juvenile King Eider had been spotted Sunday afternoon at the pier in Piermont, NY. It was not verified and reported on the ListServ until yesterday. Since I am on vacation, I decided to see if it was still hanging around today. Unfortunately it was also pouring rain today, so I wasn’t sure if it was worth the trip. But the pier is not that far, so off I drove windshield wipers slapping. When I arrived, the parking lot by the ball field was empty, not a good sign. But I drove out onto the pier anyway just to see for myself. There were rafts of Ruddy Ducks and large flotillas of Buffleheads. I saw a Song Sparrow, 3 Chipping Sparrows and a Mockingbird. There were loads of Ring-billed Gulls. But No Eider. Or anything that looked like an Eider. Or even anything big and brown. Disappointed, I stood alone at the end of the pier in the pouring rain glassing the open water. I saw a Great Cormorant wing past. Watching it; I saw a large brown duck pop up in my field of view. 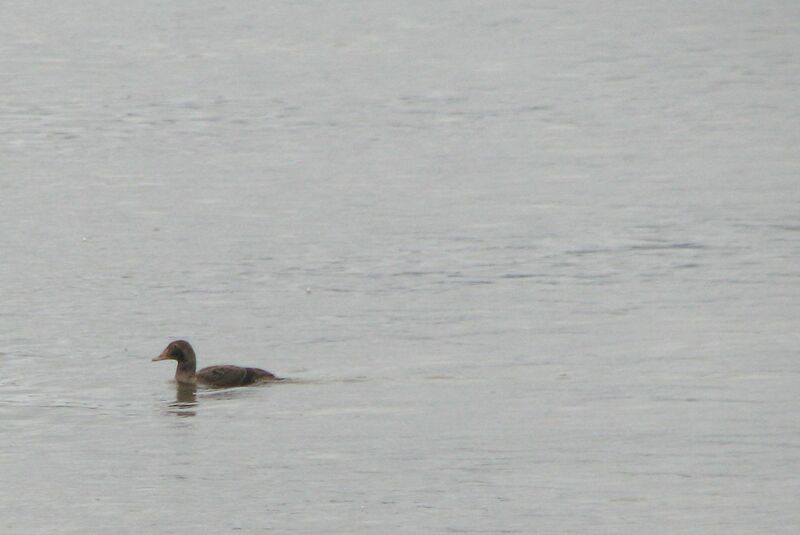 And low and behold, voila, one juvenile King Eider. It was still there. But there were no other birders. Yes, it was teeming, but I have often birded in the rain. True, the pictures are not great, but I do have some. With the holiday coming up, I image the pier will be packed with birders in the next several days. It was nice to have quality time with the King. To see what this guy will grow up to look like, visit Picusblog he has a shot of an adult taken in Massachusetts. The first and only time I saw Tufted Puffins I was so excited I grabbed the guy standing next to me (I am not so sure he was as completely enthralled as I was.) and started jumping up and down. 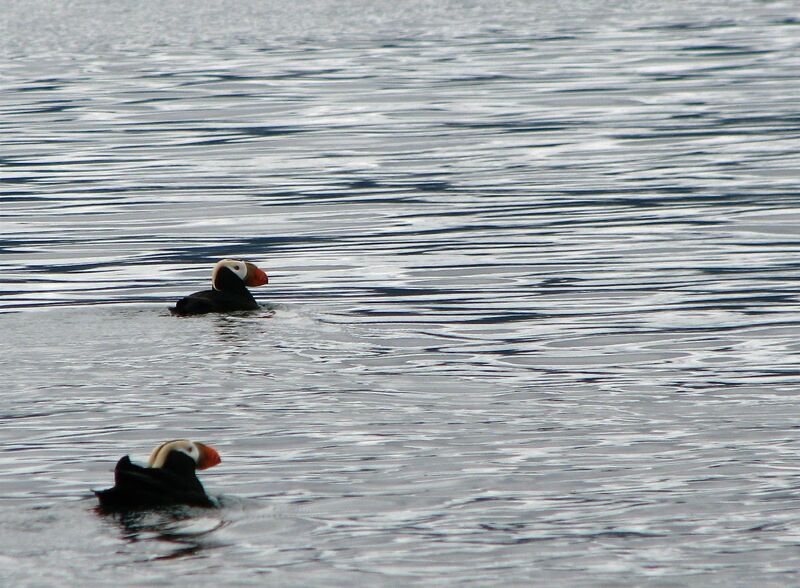 I had seen Atlantic Puffins in Maine and Nova Scotia, of course; but the western puffins had eluded me. I think everyone on the boat was excited and for many of us it was a life bird. It is so distinctive looking–the bills, the tufts. It is right up there in the favorite bird category. To see other cool birds, check out Bird Photography Weekly. I stood at the kitchen sink talking to my sister on the phone. The wind was howling around the house and the thermometer read 6F. The neglected rusty brown oak leaves in the backyard were swirling and dancing in the gale. I squinted; one of those blowing leaves appeared to be doing the double-footed backward scratch. I had had White-throated Sparrows on and off for the past few weeks, but this was bigger and oak leaf colored. I stopped listening to the chatter about home, food and her new haircut as I searched for the binoculars. “Uh huh,” I answered without listening. I had lost the bird amidst all the leaves. I lowered the binoculars. The bird had moved close to the house. 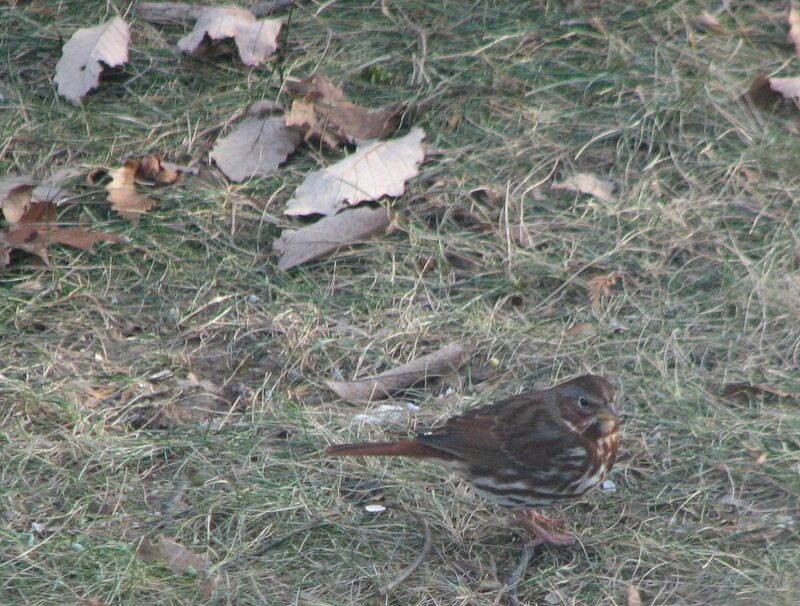 It was a large rusty red Fox Sparrow. Cheese, I couldn’t remember the last time I had seen one. I was trilled. I watched it peck the ground, doing his signature back step as my sister went on, and on. When I got off the phone I went out to throw some seed on the ground, hoping it would stay around. Later that afternoon I noticed that there were 2 birds not one. They were skittish, flushing when a squirrel hopped over to investigate the seeds, or a Blue Jay horned in on the bounty. If I opened the French doors to the deck, they would fly. I resorted to trying to take their picture through the glass. I hope they hang around. Hey, pull over! What is that? Over there, in that tree? We all stared perplexed at the lump. We got out of the car and crossed the road to get a better view. 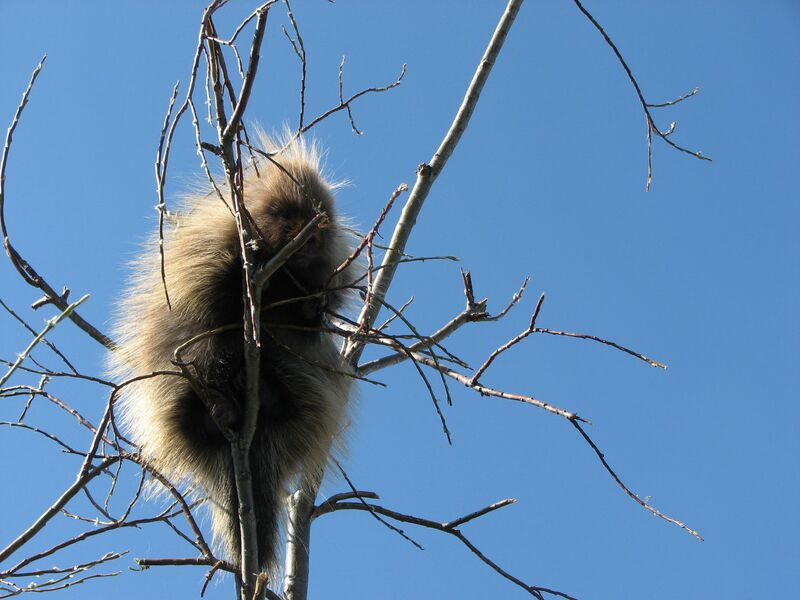 Holy mackeral, it was a baby porcupine eating the twigs of a sapling willow. It was the cutest thing. I had never seen a baby one before. Then we noticed mama (or papa) in a sturdier tree by the car starting to inch down backward. We decided to leave before there was an incident. Part of being outdoors is seeing the unexpected. Cool, huh.